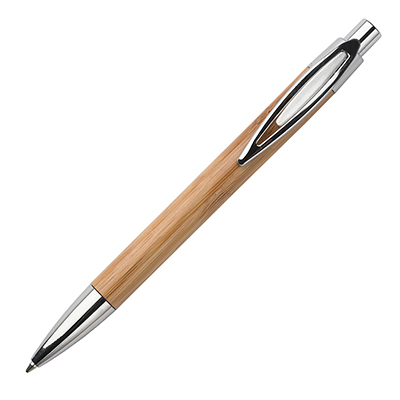 Model:TPC443802 BAMBOO PEN Description: A stylish click action pen made from bamboo with silver fittings. Colour Options: Wood 0.011 Product Data Specification Product Size 140 x 12 mm dia Product Weight Ink Colours If Applicable black Additional Information Price includes 1 colour print to 1 position only. Set up and carriage are additional. Lead Times 7 working days from approval of artwork Personalisation Data Max Personalisation Pad/Screen Print Area 35 x 20 mm Engraving Area Full Colour Area N/A Embroided Area N/A Max Spot Colours N/A Foil Block Embossing N/A Notes Price includes a 1 colour print to 1 position. Set up and carriage are additional. 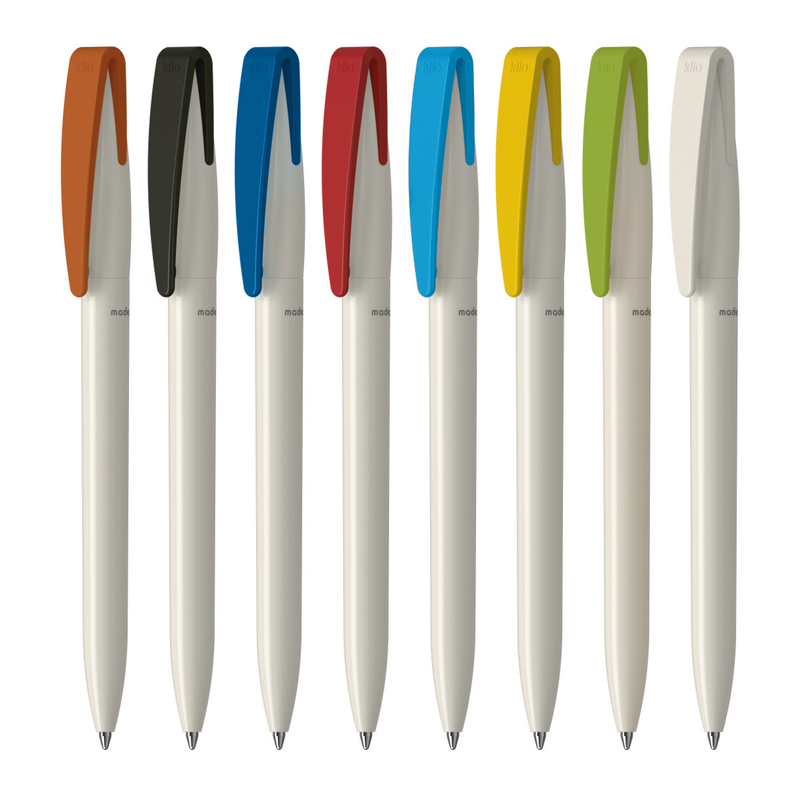 Model:TPC260101 BIO-INSIDER COLOUR Description: Sustainability gets a novel shape with this eco friendly writing instrument. This unique German ballpoint pen consists of at least 90% cellulose acetate, a renewable, bio-based material. The plunger is optionally available in transparent ABS plastic or cellulose acetate. Due to the nature of the material there may be colour variations of the barrel and clip. 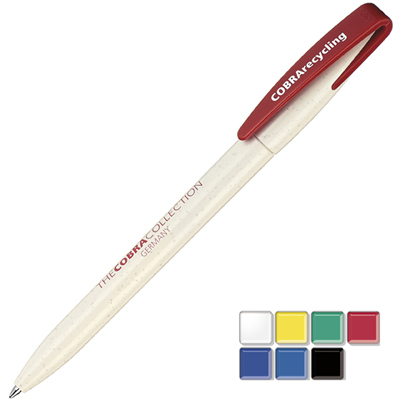 The ECO-LINE ballpoint pen is equipped with a replaceable quality Jogger refill. White with clear translucent plunger only available in 5 working days. Colour Options: Product Data Specification Product Size 141 x 10 mm dia Product Weight0.011 Ink Colours If Applicable black Additional Information Price includes 1 colour print to 1 position only. Set up and carriage are additional. Lead Times 4 weeks from approval of artwork (except for the white with clear translucent plunger which is available in 5 working days) Personalisation Data Max Personalisation Pad/Screen Print Area 50 x 20 mm (barrel), 33 x 5 mm (clip) Engraving Area Full Colour Area N/A Embroided Area N/A Max Spot Colours N/A Foil Block Embossing N/A Notes Price includes a 1 colour print to 1 position. Set up and carriage are additional. Model:TPC550203 COBRA BIO Description: All three parts of this twist action favourite from Klio Eterna are made of Bio Material, compostable plastic compound (polylatic acid from vegetable starch). Clip can be combined in 7 solid colours. Min 500, 4 week delivery. Available in white with yellow, red, dark blue, blue, green, black or white clips Colour Options: Black, Blue, Dark Blue, Green, Red, White, Yellow Product Data Specification Product Size 141 x 8 mm dia Product Weight0.096 Ink Colours If Applicable black or blue Additional Information Price includes 1 colour print to 1 position only. Set up and carriage are additional. Lead Times 4 weeks from artwork approval Personalisation Data Max Personalisation Pad/Screen Print Area 40 x 20 mm (barrel), 30 x 4 mm (clip) Engraving Area Full Colour Area 40 x 7 mm Embroided Area N/A Max Spot Colours N/A Foil Block Embossing N/A Notes Price includes a 1 colour print to 1 position. Set up and carriage are additional. Model:TPC550202 COBRA RECYCLED Description: A best selling model from the Klio Eterna range made from recycled ABS plastic. All three parts van be combined in 16 high gloss colours. Min 500, 4 week delivery. Colour Options: 16 Product Data Specification Product Size 141 x 8 mm dia Product Weight0.096 Ink Colours If Applicable black or blue Additional Information Price includes 1 colour print to 1 position only. Set up and carriage are additional. Lead Times 4 weeks from artwork approval Personalisation Data Max Personalisation Pad/Screen Print Area 40 x 20 mm (Barrel), 30 x 4 mm (clip) Engraving Area Full Colour Area 40 x 7 mm Embroided Area N/A Max Spot Colours N/A Foil Block Embossing N/A Notes Price includes a 1 colour print to 1 position. Set up and carriage are additional. Model:TPC260201 ORGANIC COLOUR Description: A real eco alternative. At 90% renewable, bio-based materials produced on cellulose basis. The coloured pusher allows us to implement corporate colours. This writing instrument is manufactured in Germany with a quality Jogger refill. Due to the nature of the material there may be colour variations of the barrel and clip. White with white frosted plunger available in 5 working days. Colour Options: 17 Product Data Specification Product Size 145 x 10 mm dia Product Weight0.006 Ink Colours If Applicable black Additional Information Price includes 1 colour print to 1 position only. Set up and carriage are additional. Lead Times 4 weeks from approval of artwork (except for the white with white frosted plunger which is available in 5 working days) Personalisation Data Max Personalisation Pad/Screen Print Area 50 x 20 mm (barrel), 35 x 7 mm (clip) Engraving Area Full Colour Area N/A Embroided Area N/A Max Spot Colours N/A Foil Block Embossing N/A Notes Price includes a 1 colour print to 1 position. Set up and carriage are additional. 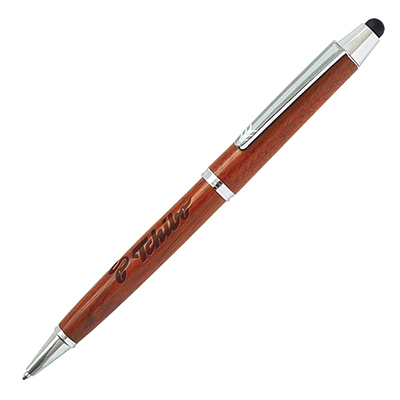 Model:TPC230601 ROSE WOOD STYLUS PEN Description: An eco friendly twist action pen with rosewood barrel and metal trim, comes complete with stylus for touch screen devices. Colour Options: Rose Wood Product Data Specification Product Size 145 x 10 mm dia Product Weight0.015 Ink Colours If Applicable blue Additional Information Price includes 1 colour print to 1 position only. Set up and carriage are additional. Lead Times 3 weeks from approval of artwork Personalisation Data Max Personalisation Pad/Screen Print Area N/A Engraving Area 45 x 6 mm Full Colour Area N/A Embroided Area N/A Max Spot Colours N/A Foil Block Embossing N/A Notes Price includes a 1 colour print to 1 position. Set up and carriage are additional.